In 2012, the FotSJR Board of Directors established the Al Smith Watershed Stewardship Award to honor individuals who display a passion for the health of the watershed. 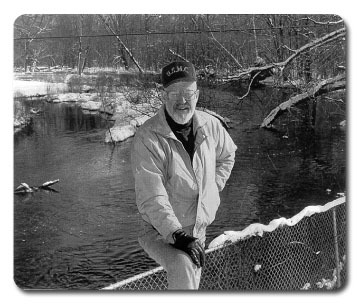 The award is named in honor of FotSJR founder Al Smith who worked tirelessly to improve the St. Joseph River. Click here to view past award winners. Shares their passion with others for the health of one or more rivers, streams and/or lakes in the St. Joseph River Watershed (HUC 04050001). Has been active as an individual or as a key person in a business, organization or agency promoting stewardship in the watershed. Is not required to be a current or past member of the Friends of the St. Joe River Association (FotSJR). Shall not be actively serving on the FotSJR Board of Directors. Click here to download the Al Smith Watershed Stewardship Award Nomination form. Nominations must be received by the January FotSJR Board Meeting. The FotSJR Board of Directors, Watershed Council representatives or the general public may submit a nomination form for consideration. ONLY FotSJR Board Directors shall review the award nominations,and cast their vote at the monthly FotSJR Board meeting prior to the annual meeting. Winner will be announced at the annual meeting. Award winners receive a lifetime membership to the FotSJR. Al passed away peacefully on April 5, 2011 at the age of 86.